…then apparently I’ve been doing some of the moves wrong. On Tuesday I took a lesson with Chemaine of Symphony Dressage. I’ve lessoned with her before a while ago and she is a very nice person and gifted trainer. The night started off rough. I warmed up on my own in a different ring and it wasn’t pretty. Hemie was tense and tried to spook at everything rather than work. He’d had the day before off and I should have longed but didn’t have time. I was feeling nervous heading over to the dressage area for our lesson. Chemaine is very welcoming. Surprisingly, she asked if she could ride Hemie for a few minutes. Yes please! Hemie was tense about rein contact and his hind legs barely moved forward. But then he started to loosen up. Chemaine figured out pretty quick that he likes being talked to. She demonstrated an approach she ultimately had me do. I hopped on and the whole lesson was spent in a 20 meter circle. The first exercise was to ask for lots of inside bend, even over-flexing the neck, asking the hind legs to cross. Outside rein to be a “dumb hand” and held absolutely still, near the saddle. Inside hand to do continuous wiggling of the rein to slide the bit around in his mouth, lulling him into relaxation and softening the jaw. The wiggling is to be done at all times, subtlety/loudness depending on what is needed at the time. I asked if this is a short term or long term solution for better contact, and she said that each horse is different but that she uses is regularly with lots of her horses. Lots of the lesson was spent on my weight positioning, and has made me realize that (a) I’m not always aware of where my weight is, and (b) I could be hindering Hemie with having my weight in the wrong place. Specifically, I need to weight the inside stirrup when walking and trotting a circle, and on inside hip when cantering so that he lifts me up and over. 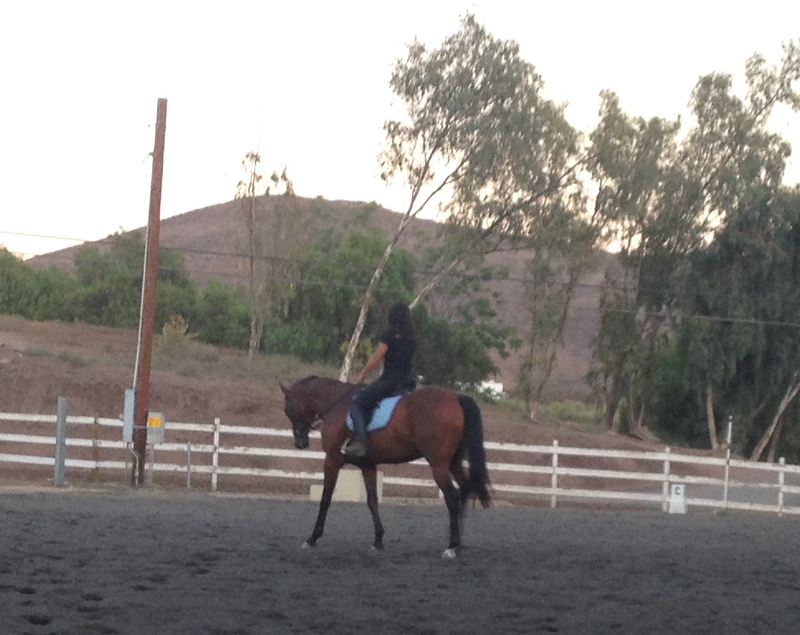 I cannot let my weight shift to the outside seat or outside stirrup – that throws of his balance. The next exercise was to slow the trot down significantly, and wiggle and leg-yield until he steadies his connection to the outside rein, then allow a more forward trot, keeping the outside rein connection and good balance for as long as possible (keep wiggling inside), then slow down again when he connects too much to inside rein or loses balance. Basically we are rewarding him with forward movement when he has steady outside rein connection. I had a hard time keeping my weight to the inside when we had a forward trot, but we kept it longer when I was more mindful of it. This approach is basically backwards from what I’ve been doing: asking for forward first, then increasing connection to be more steady. Chemaine described Hemie as worried, a term Laurie and I haven’t used lately (more like naughty and tense). But worried is a good term, and reminds me that I need to reassure him about dressage. She also said that he is even in his mouth – not especially heavy or light on one side versus the other. And that he is quite sensitive to leg and seat pressure. It was good to hear all that – I’m used to him and don’t ride a ton of other horses for comparison. She also said he was better than she was expecting him to be. I’m not sure if I should be happy he exceeded expectations, or concerned that she had such low expectations to begin with… In any case, it was a positive lesson and right now I’m leaning towards my 4th quarter lesson/clinic to be with her as well. Something of note – there were ZERO incidents of faux spooking the entire ride. And no shoulder popping (maybe some slight drifting, though). He felt very even both directions, with no pronounced issue tracking right. Overall I came away from the lesson being much more mindful of my positioning, and realizing that if he’s stiff it probably means that I’m being stiff. Glad you had a good lesson, though! Position and relaxation is half the battle. The other half is remembering you need to pay attention to position and relaxation. huh, sounds like a really really productive ride! the whole weight and positioning thing is so tricky bc we have so much muscle memory – but that's a great insight about weighting the inside on the circle. i also like your description of the inside bend/flex, as i've been putzing around with that but will probably modify my approach after reading this. anyways – glad it was a good ride and hope the lesson sticks! Great that you had a good lesson! I need to remember to shift my weight to the outside – wish we could part trade our habits and both end up even!! Sounds like a nice ride. I have also been working on keeping my weight on the inside stirrup. I'm making sure to practice it every ride – and I do notice a difference when I'm thoughtful about it vs when I'm not. Amazing how that works. Its always something, isn't it? I guess that's why we pay the big bucks to those trainers and such. =) She told me my lesson was similar to one she gave you over the weekend. And she was very proud of you and happy for your outing FYI. She communicates very directly, yet so very tactfully – I took everything she said to be honest and encouraging. Thanks! Yeah its hard but important!